Co-authored by Raymond R. Skye, Grand River Six Nations Territory and Zig Misiak, the First Nations, Métis, Inuit Teachers Resource Guide has been revised based on the 2014/2015 curriculum changes. It has also been broadened to include other First Nations across Canada as well as other cultures around the world. This resource/guide meets requirements outlined in the First Nations, Metis and Inuit Ed. Policy Framework and is compatible with all of the grade levels and subjects in the Aboriginal Perspectives/ The Teacher’s Toolkit. The FNMITRG is inter-disciplinary, cross-curricular, easy to use, a ‘big thinking’ concept and loaded with many interesting class room activities. Below the video you’ll find the introductory letter, table of contents, over view and list of contributors. The First Nations, Métis, Inuit Teachers Resource Guide, though focused on the Six Nations, is now much broader and inclusive of other First Nations, Métis and Inuit. The resource/guide also reaches out to other cultures from around the world. The lesson plans have input from a myriad of First Nations sources as well as both the Public and Catholic School Boards. In-class testing was done and teachers passed it with flying colours. As of January 2019, our guide is currently being used by 723 assorted teaching institutions. It has been acknowledged by the Aboriginal Education department of the Ministry of Education, and recognized by the Ontario Native Literacy Coalition, the Elementary Teachers Federation of Ontario and the Canadian Indigenous/Native Studies Association (CINSA), ASLC Lit Picks (Alberta School Library Council). The First Nations, Métis, Inuit Teachers Resource Guide is current, based on the 2013/2014 curriculum updates. It aligns with the First Nations, Métis and Inuit Education Policy Framework. It also supports all the topics found in the Ministry of Education’s Aboriginal Perspectives – The Teacher’s Toolkit. While some of the content is aimed at specific grades as directed in the Ontario Curriculum, this guide can be used at all levels of education and for various subject areas. Evaluation and Assessment can focus on what works for you in your classroom and what works for your students and therefore is left open to the user. All three stories and the artwork related to these stories are provided by Raymond Skye, Tuscarora/Seneca from the Grand River Six Nations. Ray and I documented the oral history he recalled hearing from his parents and other elders. My non Native perspective comes from accumulated knowledge derived from over five decades of academic studies, as a historic re-enactor and my long time relationship with Ray and his people. We carefully blended both views that resulted in this wonderful grass-rooted, authentic and trusted resource. Your First Nations, Métis, Inuit Teachers Resource Guide contains many wonderful hands on components that stimulate all five senses and bring the material alive for you and your students. ** We purchased the traditional songs CD’s and the bone rattles from Grand River Six Nations. 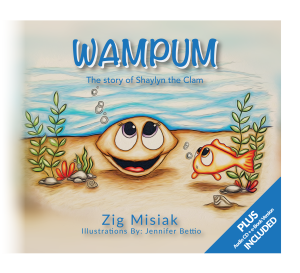 Wampum: The story of Shaylyn the Clam (Grade 2 to 7) is a beautifully illustrated book about a clam that was picked up by a little Native girl named Skawennahá:wi. The clam was used for food and its shell made into wampum. This book gently draws the reader into understanding wampum, wampum belts and strings. Includes audio CD and e-book. Western Hooves of Thunder (Grade 3 to 6) is about a young Mohawk boy and his non Native friend Catherine who lived peacefully on the banks of the Grand River never thinking that the War of 1812 events would end up in their own back yard. Ayewate and Catherine respect and share their cultural differences. 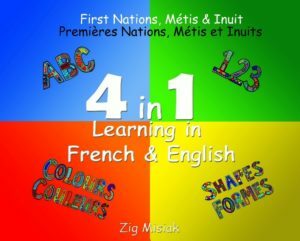 4 in 1 Learning (K to grade 3) is 4 books in one, ABC’s, 123’s, Colours & Shapes. It is in French & English, and is based on nature and First Nations, Métis and Inuit themes and imagery. 4 in 1 Learning has over 80 beautifully drawn panels with over 70 assorted animals, insects, plants and inanimate objects. They are interwoven creating a powerful and stimulating tapestry of colours and shapes. Enjoy, have fun and learn. Supplemental Q & A for the books are available in ‘Product Resources’ tab. The following is a framework summary prepared by Linda McGregor, Manager of First Nations Métis and Inuit (FNMI) Education Initiatives with the Simcoe Muskoka Catholic District School Board further edited and condensed by Zig Misiak. The Ministry will provide progress reports every three years based on the following goals and performance measures. 1. Significant increase of FNMI students in reading, writing, & mathematics. 2. Significant increase in FNMI teaching and non teaching staff in school boards. 3. Significant increase in FNMI graduation. 4. Significant improvement in FNMI student achievement. 5. Significant improvement in FNMI student self-esteem. 6. Increased collaboration to ensure FNMI students in FNMI education authorities are adequately prepared to make the transition to provincially funded schools. 7. Increased satisfaction among educators in provincially funded schools with respect to professional development and resources to meet the Policy Framework. 8. Increased participation of FNMI parents in the education of their children. 9. Increased opportunities for knowledge sharing, collaboration, and issue resolution among FNMI communities, schools and school boards and the Ministry of Education. 10. Integration of education opportunities to improve knowledge of ALL students and educators in Ontario about the rich culture and histories of the FNMI Peoples. 1. Improve areas of literacy and numeracy. 2. Increase retention, graduation and advancement to post-secondary studies. 1. Lack of awareness and understanding related to Aboriginal learning styles, culture, history and perspectives. 2. Lack of curriculum that reflects First Nations, Métis and Inuit culture. 3. Lack of effective counseling and outreach. 4. Lack of awareness of intergenerational mistrust of the “system” attributed to residential school experiences. 1. Create a real sense of belonging. 2. Create engaging school community outreach and inclusion of culture in curriculum. 3. Create systems responding specifically to learning and cultural needs. 4. Create programs, services and resources for achievement, esteem, and cultural identity. 5. Create and facilitate learning about traditional and contemporary perspectives. The primary focus of the First Nations, Métis, Inuit Teachers Resource Guide is on integrating the learning about First Nations Studies. This includes Character Development/Faith based Virtues, and existing curriculum, highlighting similarities between First Nations Peoples and non First Nations people – and people from all other parts of the world, referred to by the Haudenosaunee as Turtle Island. Ontario Curriculum, Cross Curricular & Interdisciplinary lesson plans. The First Nations, Métis, Inuit Teachers Resource Guide has been supported by First Nations and non First Nations educators and curriculum experts from the boards of education in Brant Haldimand Norfolk CDSB, Grand River Six Nations Territory, Grand Erie DSB and many other First Nations and non First Nations contributors. The approach used in our resource guide seeks a balance between written and oral tradition, recognizing and respecting the validity of both. The Creation Story tells of the formation of the planet earth and all living things. The Clans of the Haudenosaunee story describes how the clans came to be. The third story, Formation of the Confederacy, is in three parts. The first part begins with the coming of the Peacemaker to the land of the Five Nations. The second is his meeting Hayenwah:tha and the third is their journey throughout the land of the Haudenosaunee bringing the people the ‘Good Word’ and presenting the ‘Great Law’. There are seven sections of lesson plans, 4.1 to 4.7, and classroom activities related to the stories contained in Section 3 including contemporary references. The lesson plans focus on the new curriculum and are appropriate and applicable for many levels including secondary and post secondary schools. Assorted images support the stories in Section 3 and the inclusion of three books, Western Hooves of Thunder, War of 1812: Highlighting Native Nations and Tonto: The Man in Front of the Mask, relate to post contact history, geography and culture. For the users convenience a template of the student booklet has been included in section 5. Permission is granted to make unlimited copies. With the purchase and ownership of this First Nations, Métis, Inuit Teachers Resource Guide each teacher’s resource binder allows the user to copy the related printed contents specifically for one classroom. A written request and a validated response is required before any other part of the First Nations, Métis, Inuit Teachers Resource Guide can be copied for other than the above intended uses. A DVD introduces the First Nations, Métis, Inuit Teachers Resource Guide. It includes village scenes from early-contact, scenes in a longhouse and along a river. A Haudenosaunee elder and his grandchildren are seated around a modern campfire as they are visited by three Haudenosaunee story-tellers who each share a shortened version of the three stories. Enjoy the background sounds of the traditional water drum and rattle, as well as clan images, maps and photographs. An audio CD contains the complete readings of the three stories in the binder and is supported by the student booklets. The stories are read by Haudenosaunee educators Stacey Hill, story-teller Lorrie Gallant, and artist/historian Raymond R. Skye. Two music CD’s, #1 and #2, are authentic Haudenosaunee traditional songs. A 46 min. audio CD, Western Hooves of Thunder, read by author. Integrated into the stories are Haudenosaunee names, words and terms in the Mohawk (M) language. Cayuga (C) and Onondaga (O) are also referenced in the glossary. Zig Misiak, author/historian and Six Nations artist, Raymond R. Skye collaborated on the development of the First Nations, Métis, Inuit Teachers Resource Guide with significant contribution from both First Nations and non First Nations communities, including but not limited to historians, educators, Clan Mothers, Elders and Chiefs, professionals from the Ministry of Education, Ministry of Aboriginal Affairs, the Ontario Federation of Elementary School Teachers, along with a host of other contributors from culture, tourism, and First Nations organizations. It has been through the generous contribution of our benefactor, King and Benton, that we have been able to produce this valuable, unique and easy to use teacher’s resource guide. The First Nations, Métis, Inuit Teachers Resource Guide was initiated and created by Zig Misiak and Raymond R. Skye, two people who are passionate about learning and sharing their knowledge of First/Native Nations history and culture. ZIG MISIAK’s experiences as a historical activist, author, and long time re-enactor span several decades. He sits on numerous boards and organizations, consulting with people who document history through film, books, re-enactments, and educational publications. He has been working with educators over the past several years to augment existing curriculum relative to First/Native Nations, specifically the Haudenosaunee. Awę́dǫdyǫh a.k.a. RAYMOND R. SKYE, Haudenosaunee Artist, from Six Nations Grand River Territory, who credits much of the inspiration for his artwork to the traditional teachings of his father (Seneca) and mother (Tuscarora). He has distinguished himself as an artist who bases his work on extensive research of both oral and written sources pertaining to Haudenosaunee history and culture. The First Nations, Métis, Inuit Teachers Resource Guide was made possible by the generous contribution of our benefactor, King & Benton, who sponsored the initial development of the curriculum guide, DVD and audio CD. Sakokwenionk:was, Tom Porter, author, (Mohawk, Bear Clan Elder, Akwesasne), Dianna Clare, Teacher; Catherine Cornelius, (Oneida of the Thames, Wolf Clan), Indian Art-I-Crafts; Dina Dalia, PhD, Principal, St Johns College; Stacey Hill, (Mohawk Nation, Turtle Clan), Language Teacher/Cultural Resource; Patricia Kings, Superintendent of Education, Brant Haldimand Norfolk CDSB; Dave, Levac, MPP Brant; John Lostracco, Principal, Niagara CDSB; Evelyn Martin, Superintendent of Schools Indian and Northern Affairs Canada; Lynn Millar, Elementary School Teacher; Lois Paquette, School Teacher, St. Mary’s; Ron Robert, (Metis), Indian Art-I-Crafts of Ontario; Lloyd St. Amand, MP Brant; Roxanne Sky, (Cayuga Nation, Bear Clan); George Thomas, (Mohawk Nation, Wolf Clan), British Native Allies Re-enactor; Leslie White-Eye, Ministry of Aboriginal Affairs; Paula Whitlow, (Mohawk Nation) Woodland Cultural Centre, Curator, Grand River Six Nations Territory. Jack MacFadden consultant and past president of OHSSTA, Bill Alexander retired teacher/ Curriculum Co-coordinator Geography/ History, Eric Shapero retired teacher, Jan Howse teacher, Meri Marja-Terttu MacLeod First Nations Studies Advisor, Linda McGregor, Manager of First Nation Metis and Inuit (FNMI) Education Initiatives with the Simcoe Muskoka CDSB, Teyowisonte: Tom Deer, Kahnawake Mohawk Territory. Native Educators, Artists and Elders: Lorrie Gallant, (Cayuga Nation, Turtle Clan), Author/Illustrator/Story Teller; Rene Hill, (Mohawk Nation, Turtle Clan), Story Teller/ Cultural Resource Person; Tehahenteh, Frank Miller, Mohawk, Turtle, Mohawk Language Instructor; Don Monture, (Mohawk Nation, Bear Clan), Elder; Ohwendonh:deyo, Raymond Skye, (Tuscarora/Seneca), Artist; Tekonwaniahe:sen, Stacy Hill, (Mohawk Nation, Turtle Clan), Educator. Students: Kirstin Bomberry, Student, (Cayuga, Turtle Clan), Assumption College; Godrihwagehoh, Kiana Sky, (Cayuga Nation, Bear Clan); Hanehe:gwahs, Hunter Sky, (Cayuga Nation, Bear Clan); and the students from Princess, Elizabeth Public School of the Grand Erie DSB: Ashley Grabauskas, Orennaha:wi, Bailey Hill, (Mohawk Nation, Turtle Clan), Rahsenni:saks, Daris Hill, (Mohawk Nation, Turtle Clan); Jocelynn Hill, Henry Mudford, Silence Staats, Carter Van Every, Noah Van Every, Travis Walton. Re-enactors: Lynda Balena, British Native Allies Re-enactor; Lenny Foley, (Mohawk Nation, Turtle Clan) Haudenosaunee Re-enactor; Nancy Jensen, British Native Allies Re-enactor; Debbie Klymer, British Native Allies Re-enactor; Kim Lundberg, , British Native Allies Re-enactor, Bert Summerhayes, British Native Allies Re-enactor; Douglas Wooldridge, British Native Allies Re-enactor. Locations: Narrative location courtesy of the Woodland Cultural Centre and Historical footage at Kanata Village and Interpretive Centre and the Grand River in cooperation with the Grand River Six Nations and the City of Brantford.